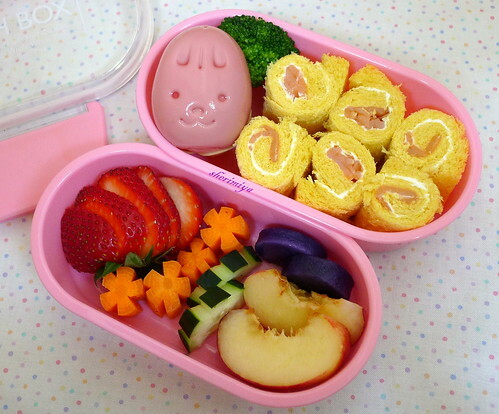 Pink Bunny Egg Bento, a photo by sherimiya ♥ on Flickr. TinySprite's two-tiered bento holds smoked salmon and cream cheese bread rollups on sweet potato bread. To make bread rollups, it's best to use soft bread. I remove the crusts, which I don't usually do, but it looks much neater this way. You can save the crusts for another use (like mac and cheese). Flatten the bread with a rolling pin, then spread the cream cheese, layer the salmon, and simply roll up tightly. Cut into bento-size pieces, and pack snugly so they don't unroll. I added a piece of steamed broccoli and a hard-boiled beet-dyed bunny-molded egg. The upper tier contains strawberry, carrots, cucumbers, nectarines and Okinawan sweet potatoes. Easy! 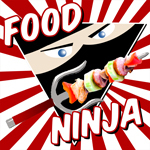 Hi sherimiya, suprise to see your blog today that I made roll bread bento for my children too. Look neat & nice too. Ha ha.. Your rollups are so cute! Love the variety you did. Thanks for stopping by! Thanks a lot Lia! I haven't used my mold for long time either! Ohhh I see sweet potato bread! I'd LOVE this sandwich. Your bento is always so cute and colorful. Very cheerful! Oh, just remember. Do you know Biren of Roti n Rice? I need to invite you to her bento banter group! Nice! I love the idea of salmon roll-ups. We don't eat nearly enough salmon... I might have to try this one! I love that you dyed the egg with beet! How did you do that? So jealous you get all these colorful yummy breads! I would have to make mine from scratch..what did you use to color your egg? Color is so good. Thanks Heather. I love salmon, and try to make it once a week if I can find it. So cute this bento...love the pink bunny! I imagine the roll up must be delicious!